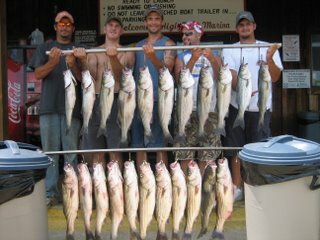 Caught bait easily this morning[100 in one cast] and picked clients up at the dock at 5:30 am. Looked for 10 minutes and found a small school of fish and put downlines on them. Caught a couple and moved and found another school and did the same. A friend Dwayne called me over to a small school he was working and we put a few more Stripers in the boat but the Buzzards [So called fisherman who just sit and wait for me to find the schools then barge right in on us] moved in on us and spooked that school. We hit a couple of more small schools until I found a large school in the mouth of a large cove and all our lines went off until, you guessed it, theBuzzards moved in again and spooked the school. I had enough of that B.S. so I picked up and went into a creek where they could not find us , found a large school and caught 40 fish out of it. Went and caught more bait and located another school and caught fish until we were busted again and had to leave. By the end of the day, We worked over 10 schools of Stripers, had over 400 hits, Yea 400, Clients caught over 100 Stripers and a dozen Catfish. 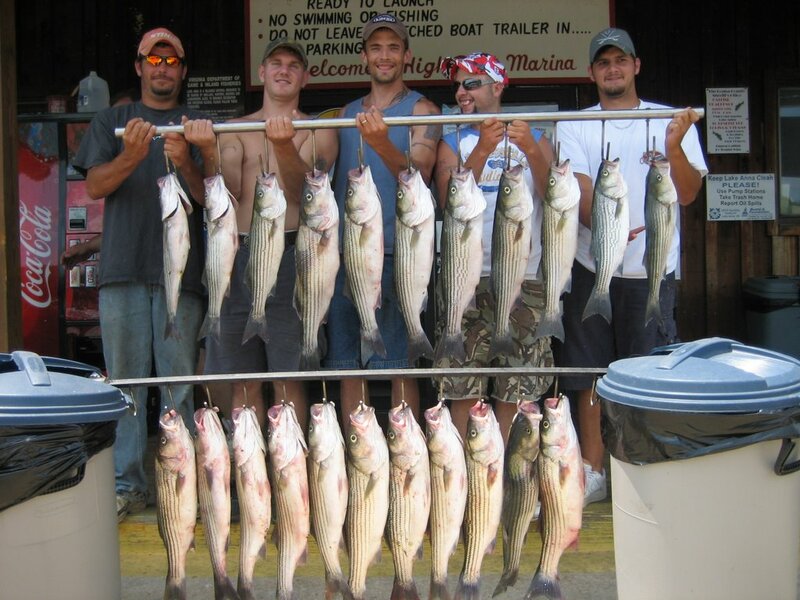 The picture shows a few of the Stripers they took home.